I don’t think I would be able to pick something I enjoy most about the course; I love everything about it. I love the design and make projects we do, the lectures, life-drawing classes, computer sessions and more. 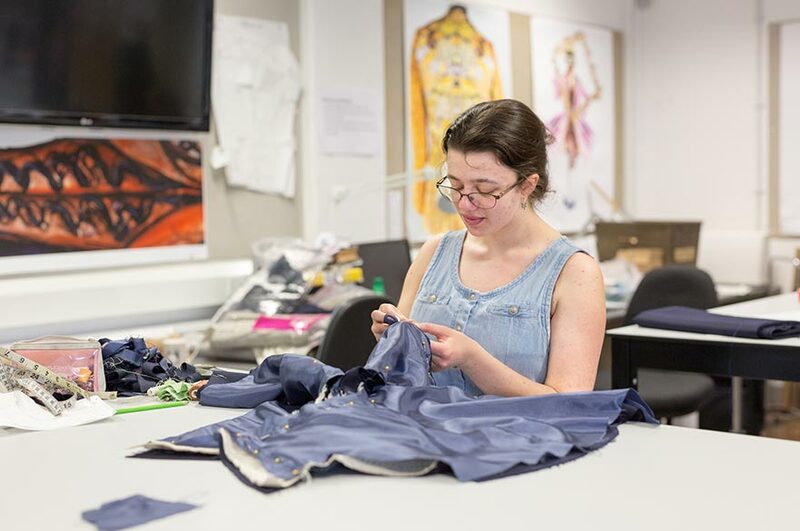 Sigrid studied BA (Hons) Costume Design and Making. During her second year Sigrid went on a summer school exchange to Donghua University in China. Can you tell us a little bit about the Hainsworth Fabrics Jacket Competition? “The project worked pretty much like any other make project in terms of how the production sessions went. This year for us (Year Two), the project briefs changed so our work became more personal, and linked costume design and costume make together. “The jacket designs for the Hainsworth Jacket Project were created during our previous design project – ‘Into the Woods’. A visit to Hainsworth helped as we were given a tour of the factory and had a look at possible fabrics. How did it feel for your jacket design to be recognised by Hainsworth Fabrics? What did you enjoy about your exchange to Donghua University? “I enjoyed learning about the history of the traditional Chinese dress, and the experience of being in Shanghai. I was very fortunate to have gotten the full-fee scholarship; it was such an amazing experience for me. What was the most valuable lesson you learnt whilst on exchange and would you recommend it to other students?